Warnings: Do not eat freshness packet. Keep in bottle. Store in a cool, dry place. Keep out of reach of children. Notes: Contains no sugar, salt, yeast, wheat, gluten, soy, milk, egg, shellfish or preservatives. Vegetarian and vegan product. 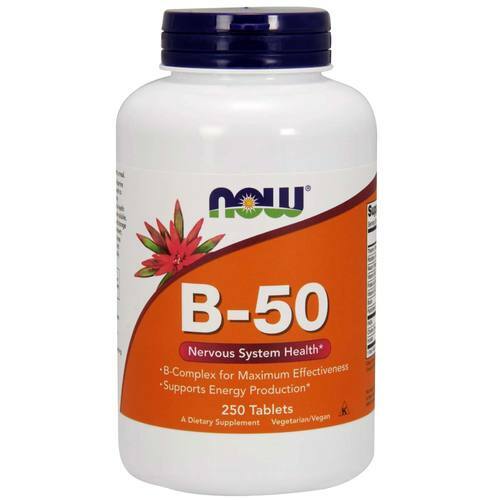 The customer reviews posted below are based on individual consumer experiences and may NOT necessarily represent what expected results will be from using or taking Now Foods B-50 - 250 Tablets. These results may not be typical and you should not necessarily expect to receive the same results. Actual results may vary. It gives me the energy I need every day.